212 pages | 142 B/W Illus. This book covers electronic and structural properties of light-induced defects, light-induced defect creation processes, and related phenomena in crystalline, amorphous, and microcrystalline semiconductors. It provides a theoretical treatment of recombination-enhanced defect reaction in crystalline semiconductors, particularly GaAs and related materials. It also discusses experimental evidence for this phenomenon. Light-induced defect creation in hydrogenated amorphous silicon (a-Si:H) is described in more detail, including its mechanism and experimental results. The subjects treated by the book are important issues from the viewpoints of physics and applications. 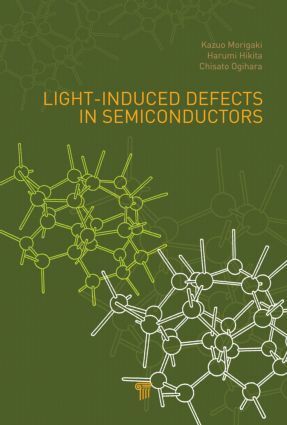 "This book is an illuminating review covering some 40 years of active research in the physics of defects in semiconductors, as well as a concentrate of the most recent progress in the field. The authors, who are themselves important contributors in the domain of light-induced defects, present a clear and well-documented review, including spin-dependant effects and a profound analysis of the properties of amorphous semiconductors." "There is no book that attempts to explain the light-induced defect creations in both crystalline and disordered semiconductors. I am convinced that the present book provides a valuable source of information and resource for MSc and PhD students and researchers with specialization in condensed matter physics, physical chemistry, and related engineering fields." "The authors’ scientific contributions to this field are extremely high. This book introduces students of physics and materials science as well as senior research workers to light-induced defects in semiconductors. An excellent reference source of the topic can be found at the end of the book." "This book presents an extensive review of photo-induced electronic properties of both crystalline and non-crystalline bulk semiconductors. It is a valuable source of reference for graduate students and all researchers in the fields of condensed matter physics, industrial physics, and materials science and engineering."